Wolf Kahn is one of the most highly regarded colorists working today. His landscape paintings and pastels always evoke a particular sense of place and season, yet they are also universal. Their radiant hues, tangy color contrasts, and pervasive sense of light are unique. This second edition of the definitive volume on Kahn’s life and work adds the achievements of the past fifteen years. An elegant new essay by the noted art critic Karen Wilkin highlights how his late work has developed. A bountiful selection of paintings reproduced in faithful color and large scale show his bold, freewheeling new work. The copiously illustrated text by critic Justin Spring details Kahn’s life and work. Beginning with the young artist’s early years as a drawing prodigy and continuing with his study with Hans Hofmann, his early success as a latter-day Expressionist, and his ten years as a painter of austere, tonalist canvases, it leads up to the brilliant, high-keyed landscapes that have established his reputation. An insightful essay by artist and critic Louis Finkelstein, “The Development of Wolf Kahn’s Painting Language,” illuminates the fusion of abstraction and representation in his work. An essential source book for the past half century of American art, this volume furnishes proof that an artist can successfully hew an independent course dedicated to the problems and pleasures of pure painting. 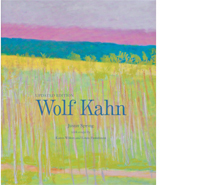 Its thoughtful essays, rich array of exquisite paintings, and generous selection of documentary photographs show why Wolf Kahn stands in the forefront of American representational art. Cataloging-in-Publication Data has been applied for an dmay be obtained from the Library of Congress. First edition essays and illustrations copyright © 1996 Wolf Kahn. Second edition new essay copyright © 2011 Karen Wilkin; illustrations copyright © 2011 Wolf Kahn. Karen Wilkin’s essay is based on her text for Wolf Kahn: Sizing Up, published in 2007 by Ameringer | McEnery | Yohe.